A lot of people don’t think about using pumpkin in savory dishes but it is great in this pumpkin taco dip. The pumpkin adds balance to the dip and great color. It is hard to pick out the pumpkin flavor. In fact, most people can’t tell there is pumpkin in the dip when they taste it. 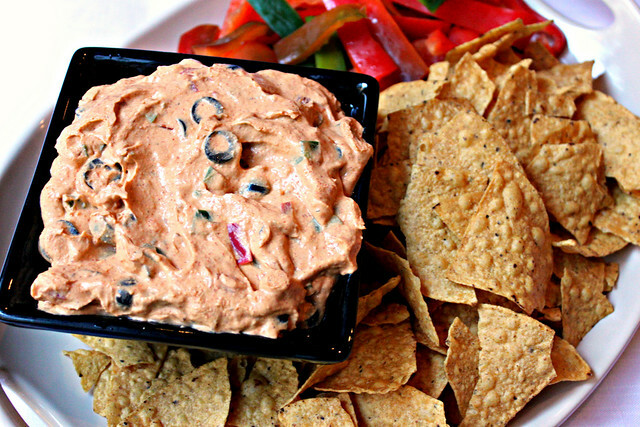 This dip would be the perfect thing to set out at any fall party! The Perfect Pairing for pumpkin taco dip is tortilla chips and pepper strips. The recipe calls for half of a green and red pepper so you can just slice up the leftovers to serve with the dip. In a large bowl combine the cream cheese and pumpkin, beat with a hand mixer until completely combined. Add in taco seasoning, garlic powder, Adobo seasoning, pepper flakes and lime juice. Mix until combined. Stir in peppers and olives, taste for seasoning. Refrigerate until ready to serve. Serve with tortilla chips and pepper strips.